70% of this planet is water. And only 5% of it has been explored. Doesn’t that make you wonder of the unthinkable creatures that must reside in the depths of the ocean? What if mermaids are real? While we wait for explorers to get back to us on that, here are some places where you can go exploring the underwater world, all close by, within driving distance. Around 530 kilometers from Mumbai, Tarkarli is a quaint beach on the Konkan coastline that has clean beaches and healthy seas. Starting from INR 1,250 per head, what you will witness here is a rich marine life that is largely untouched. Situated in Ratnagiri 346 kilometers from Mumbai, Mirya beach offers a healthy marine life up for exploration. With top notch diving gear and qualified instructors, head here if you’re short on time. Some of the diving centres here also offer night diving, which is a whole other experience. A little short of Goa, Vengurla has certified PADI (Professional Association Of Diving Instructors) scuba diving instructors equipped to take you for both beginner and advanced level scuba diving. About 540 kilometers from Mumbai, Vengurla will offer a peek into hard and soft corals, and some dives might also take you along deeply submerged rocks. From red snapper, giant grouper morels, trigger fish, lobsters, parrot fish, angel fish, to moorish idol, there’s lot to see here. The dive packages start from INR 4,000 per head. 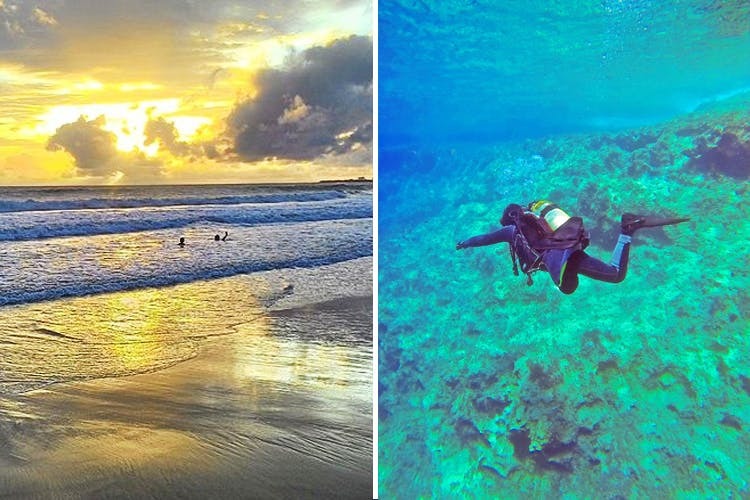 While you’ll get to scuba dive at most places on the Konkan coastline, Murud Janjira takes the cake because it also offers deep sea diving. Just about 150 kilometers away, Murud is a sleepy town with fishermen villages, the scuba diving starts at INR 4,500 here. Devbagh is about 656 kilometers from Mumbai (approximately 10 hours by road), scuba diving around the pristine beaches of Devbagh costs INR 1,500 per head. Glittering waves, calm waters, and a potential possibility of spotting a Dolphin is all you need to get motivated.